On September 28, 1975 a baby girl was born in Galveston, Texas to Richard Antonio DeLaRosa, Sr. and Dolores Munoz DeLaRosa whom they named Diane DeLaRosa. She is the 3rd child of 7 children. Diane attended Boling High School in Boling, Texas. Diane later had 3 sons, Alex Antonio DeLaRosa, Daniel Jacob Garza, and Mark Anthony Perez, Jr. Diane tried her best to be there for her sons Diane liked to cook, clean, listen to music, and loved to cook and dance. On Saturday, May 19, 2018 she answered the call from her heavenly father to come home and be at rest. 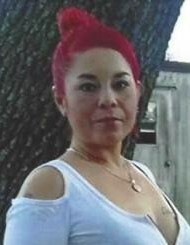 Diane was survived by her sons, Alex Antonio DelaLaRosa, Daniel Jacob Garza, Mark Anthony Perez, Jr.; parents, Richard and Dolores DeLaRosa, Sr. of Bay City; four sisters, Sylvia DeLaRosa Tijerina (Martin); Victoria DeLaRosa (Felipe) of Wharton, Juanita DeLaRosa (Armando) of Bay City and Irene DeLaRosa-Torres (Aaron) of Crosby; two brothers, Andrew DeLaRosa (Karen) of El Campo, Richard Antonio DeLaRosa of Bay City; three grandchildren, Alyana Garza, Jacob Garza, and Alex DeLaRosa, Jr., and a host of nieces and nephews. Even though you paused you will live on through your precious children and grandchildren. Diane will truly be missed.